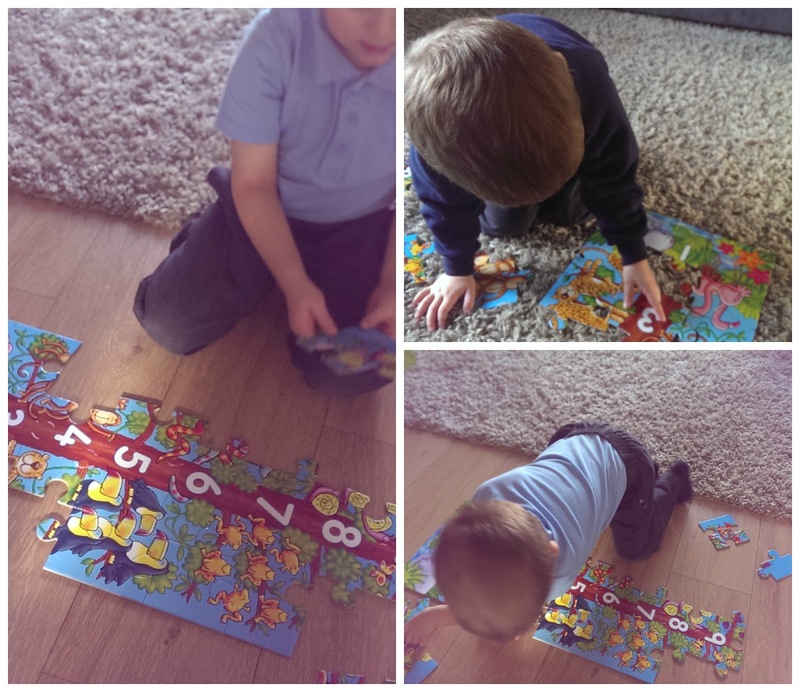 Jack is a huge jigsaw fan, he loves all different types and we are slowly introducing him to ones with smaller pieces and more pieces. So when Orchard Toys asked if we would like to review a Jigsaw for them, I knew Jack would love to. We were sent their jigsaw One, Two, Tree which is a giant number puzzle which comes with a poster. It is a colourful puzzle consisting of 30 giant pieces aimed at 3-6 year olds. When completed the jigsaw represents a tree with the numbers 1-10 up the trunk. Surrounding the tree are lots of bright animals. The animals include one hippopotamus, two flamingos, three leopards, four monkeys, five toucans, six monkeys, seven frogs, eight snails, nine butterflies and ten spiders. 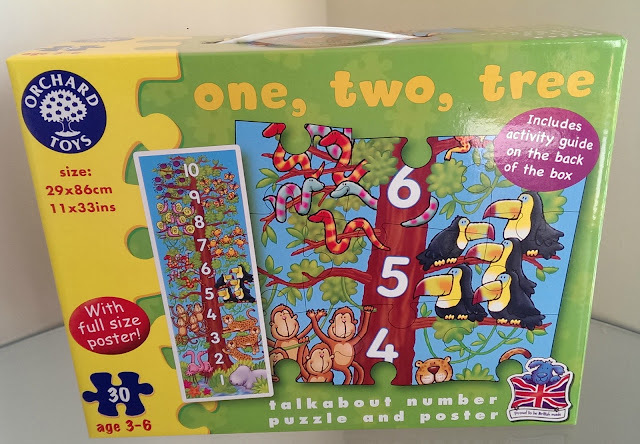 The poster included within the box is the same as the jigsaw, and is a great way to show children where the individual pieces are supposed to go. You could also use the poster to match the jigsaw pieces on top off, helping younger children to recreate the image. Both the jigsaw and poster measure 29cm x 86cm, being a great size for younger children and helping encourage counting. As with all Orchard Toys, there are some great learning skills which come with it. It helps encourage counting and number recognition, as well as encouraging matching skills. It’s been one of Jack’s favourite puzzles since it arrived and is always the first one he gets out to complete first. The puzzle is priced at £9.75 which is a good price for the size and quality of the puzzle. Please Note: We received this game as part of the Orchard Toys blogger scheme in return for an honest and objective review, this does not influence our decision.